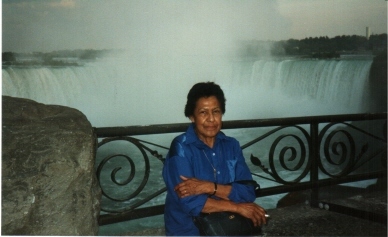 Chief Rita Smith, the mother of the Horton Band, 1918 - 1996. Rita had the distinction of being the first woman to have been Chief of two Bands, Annapolis Valley and Horton. And, throughout her life, she was a fighter who went after justice with a vengeance. Rita's first major clash with an uncaring Indian Affairs bureaucracy occurred in the late forties. The cause was the Dept. 's slow response to an application she and her husband Abe had made for housing assistance. The insensitive bureaucracy was in for a surprise, they were about to tangle with a woman who rarely accepted defeat. She won this battle hands down! During her last term as Chief of Annapolis Valley Rita, with her usual stubborn tenacity, undertook to realize a dream of seeing Horton become an independent First Nation community. In this regard, after several years of fighting, she met with success. On June 6, 1984 Horton was separated from Annapolis Valley and became independent. Rita became its first Chief. During this time, she became a member of the board of directors of the Micmac Friendship Centre in Halifax and remained so until her death. Also she was a founding Chief of the Confederacy of Mainland Micmacs and was for several years a board member of the Union of Nova Scotia Indians. Rita was also a past president of the former Mi'kmaq Arts and Crafts Society of Nova Scotia. The dedicated contributions she made towards enhancing and preserving Mi'kmaq culture during her term and through her lifetime efforts is fondly remembered. Married to a fiery, trail-blazing native leader, Noel Abraham Smith acted as the quieter, thoughtful force in his 60-year marriage to Rita Smith, one of Nova Scotia's first female native chiefs. 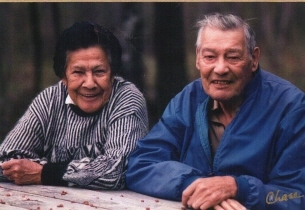 Mr. Smith and his wife worked together not only raising their nine children, but also leading two small native communities and creating beautiful, woven baskets that would make their way into museums. “They really acted as a team,” said author and friend Daniel Paul. Beginning in the late 1960s, Ms. Smith served as chief of Nova Scotia's small Annapolis Valley First Nation for three terms. During this time, Mr. Smith, best known as Abe, worked with her as a band councillor. The couple had a dream of creating an independent native community and after several years of fighting they were successful. On June 6, 1984, the Horton First Nation was separated from Annapolis Valley and became independent, Mr. Paul said. Ms. Smith became the first chief of Horton, now known as Glooscap, and Mr. Smith was again by her side as a band councillor. In the early days, they worked out of an office in their home. Mr. Smith continued to live in the small, rural community of about 60 people in Bishopville, N.S., until his death. Born in 1917 in Berwick, N.S., in the heart of the fertile Annapolis Valley, Mr. Smith grew up on the Annapolis Valley First Nation. He attended a nearby school until he turned 15 and was sent to the Shubenacadie Indian Residential School. It was an experience he didn't speak about, said his daughter Lorraine Smith-Collins. After finishing school, he worked as a farmhand until the war, when he volunteered to serve with the Royal Canadian Army Service Corps. Between 1942 and 1946 he drove a truck delivering supplies to the troops on the front lines in France, Belgium, and Germany. After the war he went to work in the woods, which he loved, providing pulp wood for the Minas Basin Pulp and Power Company in Hantsport, N.S. Around this time, he and his wife started making handmade apple baskets for the Scotian Gold Company. The Smiths soon became known as “the finest Mi'kmaq basket-making team in Nova Scotia,” Mr. Paul said. They were best known for their set of six apple baskets, dubbed the Birds Nest, which were finely crafted to fit inside each other. The set eventually retailed for $1,000 and one set now rests at the Indian and Inuit Art Centre in Ottawa. Mr. Smith would venture into the forest near his home to find the perfect white ash tree to make the baskets. He would patiently test the tree to ensure that the grain was straight before cutting it with an axe and chopping it into pieces about two metres long. Sometimes he and his wife would make baskets in the woods, but most of the time he hauled the wood home to their workshop. With as many as 50 baskets being made at a time, the effort was a family affair. Mr. Smith hooped them, Ms. Smith wove them and their kids helped wherever they were needed. “It was like assembly work. This is how they put food on the table,” Ms. Smith-Collins said. Their baskets became known not just for their utility but also for their artistry. They were featured in a 1990 video produced by CBC television in Halifax for Sesame Street and were also one of several artists in a National Film Board film called Kwa'nu'te . The Smiths continued to make baskets until Ms. Smith's death in 1996. Known as a gentle, peaceful man, Mr. Smith was always surrounded by his large, extended family. They loved to gather around him to hear his renowned ghost stories of spirits who had visited him. Also known for his kindness, he didn't think twice about helping someone in need, even if it was a stranger at the side of the road, Ms. Smith-Collins said. Noel Abraham Smith was born on May 10, 1917, in Berwick, N.S., and died on July 13, 2009, of hardening of the arteries in the Hants Community Hospital in Windsor, N.S. He was 92. He leaves daughters Patricia, Connie, Della, Sharon, Doreen and Lorraine and sons Eugene and Clarence, as well as numerous grandchildren, great-grandchildren and great-great-grandchildren.